You may have noticed that we take a particular shine to vehicle wrap projects, here at Stellar Signs & Graphics. Because our team of signage experts has many of years of experience producing high-quality signage products of all kinds, we can’t say that we have any one favorite type of sign to make. However, we must admit that our vehicle wrap projects are incredibly popular all over South Florida. Not to mention, we love making them! Check out the vehicle wrap we did for Home Health Care Resources Corp.! Pictured above, this is actually the second wrap we’ve completed for this awesome company which has also commissioned us for their lobby sign. 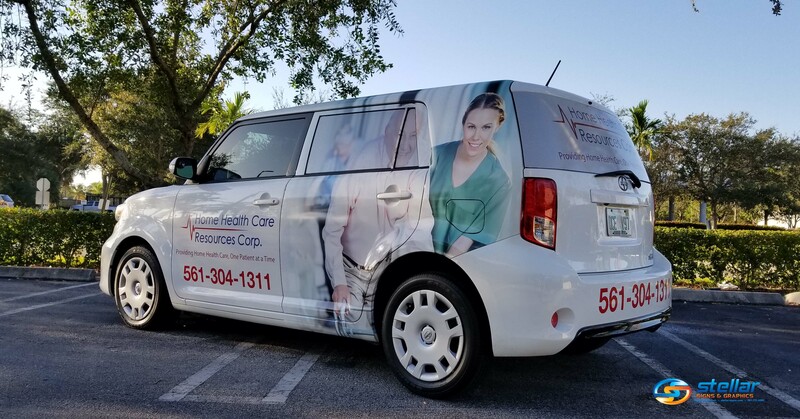 Home Health Care Resources Corp. particularly likes Toyota Scions for their company vehicles and we must admit that their eye-catching visuals work excellently with this model. We especially like this project because of the opportunity it gave our team to use two unique visuals for either side of the car. As you’ll see in the photo below, the driver side has a different image of professional caregiver and care recipient than the passenger side. 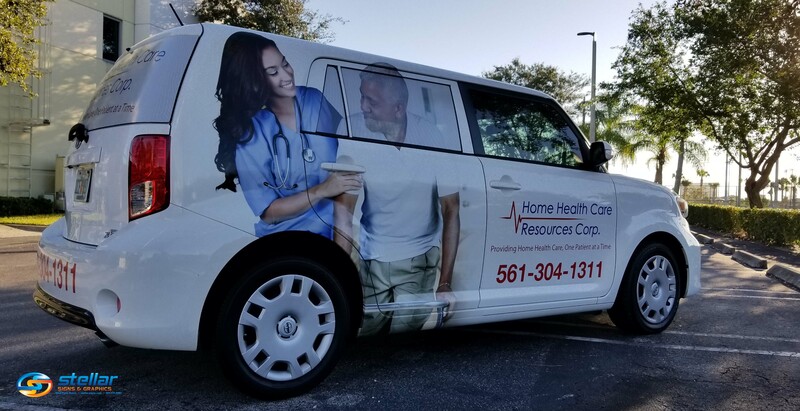 We believe that using the two different images offers Home Health Care Resources Corp. a unique vehicle wrap project that is especially eye-catching and attention grabbing. As well, because Home Health Care Resources Corp. now has more than one company vehicle with a vivid vehicle wrap, they will undoubtedly reach a larger audience. In fact, the reaching of a wider audience is one of the top benefits of utilizing vehicle wraps as advertising methods. Naturally, vehicles travel. The more destinations a vehicle visits, the more eyes a company’s vehicle wrap advertisement will attract! 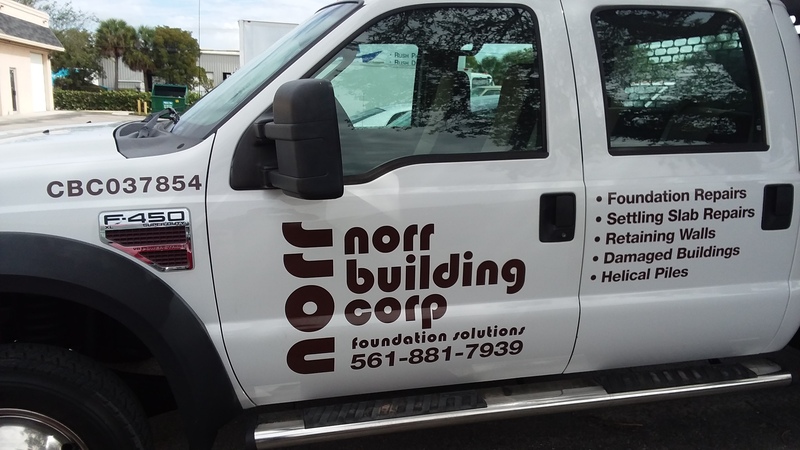 Check out the vehicle wrap we did for Norr Building Corp.! We recently completed a cut brown vinyl lettering job for their Ford Super Duty F-450 pick-up truck. As you can see in the photo below, their sleek design clearly showcases the company logo, contact number and list of services so that every pedestrian and driver who gazes upon the truck will know exactly what Norr Building Corp. is all about! Let’s get started on a vehicle wrap project for your company! The experts at Stellar Signs & Graphics serve the business communities in and around Palm Beach County, West Palm Beach, Royal Palm Beach, Wellington, Lake Worth, Boynton Beach, and Greenacres, Florida. Give us a call at 561-721-6060 today!